Part 31 is a lovely heavy solid brass gear, only ever supplied in the largest outfits (outfit 7, L, and 10). They provide a 1:1 drive when paired together at 1'' spacing, and although they can be used with other gears at odd spacings this is unusual. Since they are normally used in pairs, they can often be substituted by the multipurpose gear part 27f, introduced in 1970. When first introduced in 1919, part 31 had 40 teeth. These were only made for a couple of years, and are highly sought-after gears useful for making odd ratios in orreries and gearboxes. Largest (1921-26) and smallest (1927-41) part 31 gears. Both of these gears have 38 teeth, though. Other than the change from 40 teeth to 38 after the first two years of production, the main difference between different versions of these gears is in the outside diameter. 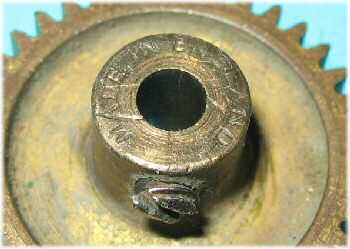 Initially 27mm (to fit the 40 teeth round), the gears stayed this size when the number of teeth were dropped to 38, leaving the gear effectively oversized. In 1927, the outside diameter was dropped to 26mm, but this was a bit overzealous, and these pre-war gears don't mesh together very well. The photo above shows the largest (1921-26) and smallest (1927-41) versions of part 31. The post-war variations increased in size a little to an intermediate size, around 26.5mm, making them work better together as pairs. Almost all of these gears are stamped Meccano, although the stamping ceased in the mid-70's. A real oddity on the stamping front is supplied by Ed Barclay. 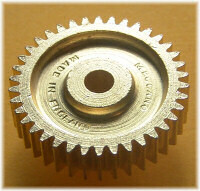 This 1'' gear wheel is from a collection of 1930's Meccano, and is stamped on the face MFEA. However, on the end of the boss we can clearly see Made in England. This is a very unusual stamping, particularly for a pre-war part. Look at: http://www.nzmeccano.com/image-85413 Mekanik no. 62 compared to Meccano no. 31 gear wheel 1"
Hi Richard thanks for your prompt reply. My dad stopped buying Meccano in the 1950's so can't think where they came from.I think you bought stuff off me a couple of years ago and gave me a lot of information. If you give me your address I would willingly let you have these free of charge. They sound like either repro gears or poorly manufactured ones from the 1970s as they weren't stamped. 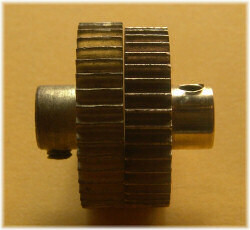 The 1" gear also meshes perfectly with the 15 tooth pinion (26c) on diagonally adjacent holes. Yes. They feel dead right. Stampings, tappings and number of teeth are exactly the same as the '.br4' you've supplied for this part. I'll send you a photo if you want (assuming I can find the tripod).